The beauty of your landscape should be visible regardless of the time of the day. 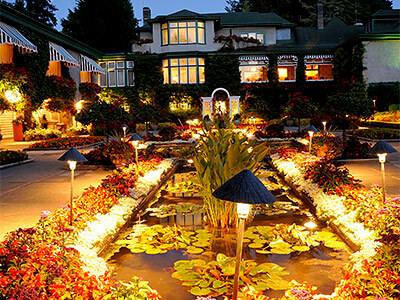 To appreciate its appeal even at night time, it is important that you have proper landscape lighting. For example, accent lights and path lights, when appropriately placed on the right locations, will definitely make your landscape more attractive. Good lighting adds beauty to your property and make you feel more secured when the outside of your home has ample lighting. With these, you can be proud of your property not only during the broad daylight but also when the sun had gone down. As it is, lighting is a very important component in achieving a successful and beautiful landscape. 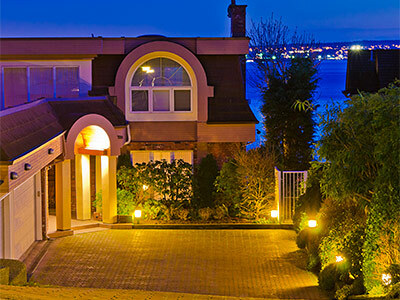 We at Gilgert's Landscaping can assist you in highlighting the significant architectural features of your home that may otherwise be disregarded during nighttime. We can also highlight pathways, entryways, and driveways for better security and convenience. We believe that good landscape lighting will only serve its purpose when installed strategically and durable lighting fixtures are used. Low voltage lighting – This type of lighting offers wide options and it operates in minimum volt supply. LED lights are examples of low voltage lights. They only use very little amount of electricity which can provide you with savings on electrical costs. They last longer than other types of lights like incandescent or halogen. Low voltage lights are also available in different lighting styles such as downlights, uplights, accent lights, path lights, and a lot more. With these lighting fixtures, achieving certain effects and moods in your landscape is not a problem. Solar landscape lighting – This is an increasingly popular alternative if you want to have a properly-lit landscape without having to shoulder high electrical costs. Solar-powered lights used in landscaping are affordable, easy to install, and eco-friendly. Whichever type of landscape lighting you want for your landscape, we can provide reliable installation. We carefully select the lighting products that we use to provide you with the best lighting fixtures possible. Let us know what you prefer and we will give you the lighting styles that you desire at the most affordable cost. At Gilgert's Landscaping, we provide excellent landscaping services while promoting products that are environmentally friendly. We provide designs, installations, and all other kinds of landscape lighting services both for newly built and existing landscaped areas in California. Our expertise in landscaping can provide your home with a beautifully-lit landscape that would also take care of your safety and security. Call us now at 209-656-0431.